The Design Cafe is located on the first floor, near the main entrance to the College of Design. 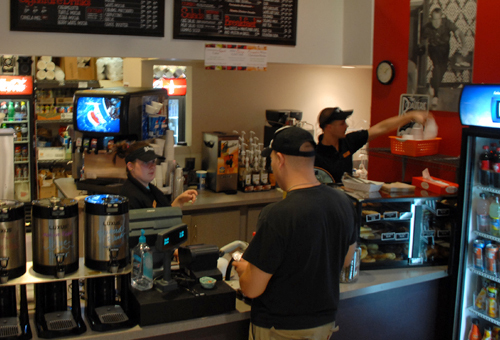 We serve coffees, teas, sodas; sandwiches, salads, sides and soups; and lots of tasty snacks and desserts! For Your Drinking Pleasure we have a selection of drip-brewed coffees available daily. We make espresso, cappuccino, latte and mocha, and have many flavored syrups. Any espresso drink can be ordered decaffeinated … or iced … or both! We have a diverse stock of teas, both black and green, and we have freshly brewed iced tea. We serve both black tea and green tea chai, hot or iced. Pop in for coffee, a nosh, or lunch! Free entertainment with every purchase! Remember: Life is short; stay awake!